Arousal-induced sympathetic activation inducing subsequent repetitive blood pressure surges and chronic hypertension. Several cross-sectional studies on the general population found a positive association between the aortic root diameter and OSA severity. Interestingly, simulating OSA in healthy volunteers with the use of Muller’s maneuver induced considerable changes in both blood pressure and proximal aortic diameter and area, probably due to increased aortic dilatory pressures. Observational studies have consistently reported that OSA is highly prevalent among patients with AAA. In one such study by Mason and colleagues, 127 patients (11 women, mean age 67.9±6) with an abdominal aortic measurement greater than or equal to 30 mm were examined. 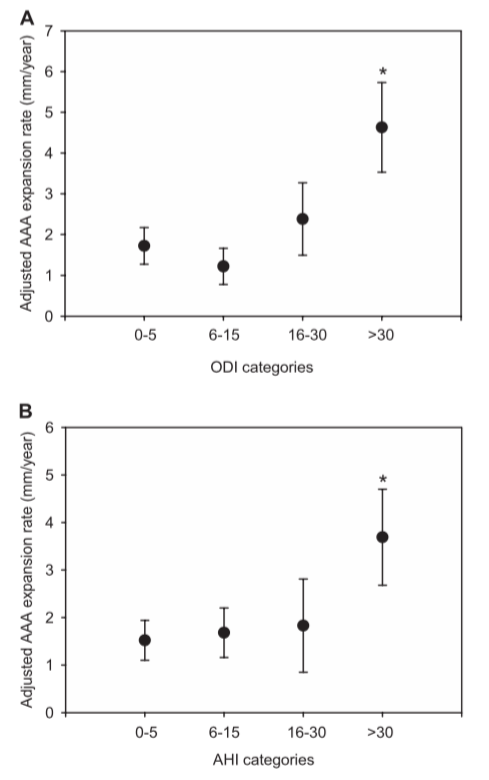 Home sleep monitoring was used to assess OSA presence in terms of ODI (>4%) and AHI. Approximately 40% of the patients were found to have an ODI greater than 10 per hour, representing a 5-fold greater incidence than in a comparable normal population. Similarly, 29% of the patients had AHI greater than 15, almost 2 times higher than the normal prevalence values. These results correspond to other studies demonstrating up to 60% OSA presence in AAA patients which is significantly higher than the estimated prevalence of 17% in the general population. Importantly, subjective reports did not reveal a correlative sleepiness, suggesting that daytime sleepiness is not suitable for detecting OSA in AAA patients. Gaisl, T., Bratton, D. J., & Kohler, M. (2015). The impact of obstructive sleep apnoea on the aorta. European Respiratory Journal, 46(2), 532-544. Mason, R. H., Ruegg, G., Perkins, J., Hardinge, M., Amann-Vesti, B., Senn, O., ... & Kohler, M. (2011). Obstructive sleep apnea in patients with abdominal aortic aneurysms: highly prevalent and associated with aneurysm expansion. American journal of respiratory and critical care medicine, 183(5), 668-674.